The last of the V15.5 Updates series is here in BETA, Update 6, and with it come new features, improvements and even better usability. Update 6 adds a web based softphone that uses WebRTC. To enable the new softphone for users login to the management console and under Settings > PBX > General > Enable WebRTC softphone in Web Client (Beta). 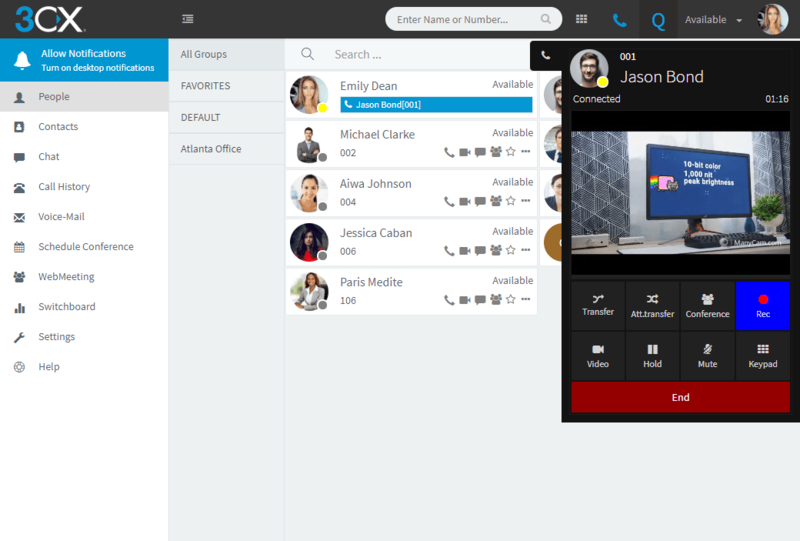 Then, from within the web client click on the phone icon in the top right and select the 3CX Web Client as your phone of choice. The PUSH functionality for the iOS and Android smartphone apps has undergone major improvements. It is now much faster and more reliable. Additionally, you can now register multiple devices for PUSH on the same extension. Make sure you have the latest clients installed. And lastly we now support Avaya IP Phones 9601, 9608G, 9611G, 9621G and 9641G in legacy mode. Added the ability to import / export unsupported SIP Trunk Templates. Added the ability to opt-in and out of call recordings in queues. Added distinctive ringing for multiple queues. Added chat toasters to incoming chat messages. Updated the password policy for all password fields changing the length from 6 to 10 and forcing the use of an upper and lower case character. Added the ability to configure the codec priority for internal calls and a different priority for external calls. Added support for Microsoft Dynamics 365 CRM. For a complete list of release notes, see the change log. Go to the updates section on the dashboard of the management console where you will see a release update 15.5 SP6 Beta. Click on the update and SP6 will be installed. Important: When upgrading to Update 6 BETA note that the Audio-UDP ports have changed from 9000-9500 to 9000-10999. Adjust your firewall configuration accordingly. If you want to download a new installation you can download the Linux version or the Windows version. Linux: Download 3CX ISO from here. Windows: Download the Windows installation here. This BETA version should not be installed in production systems. Install only for evaluation purposes. Backups taken from BETA versions will not work. This version is not covered by any support SLA.